Blacktown Hospital emergency department staff show their support Aprils Falls Day: (L-R) Ray Flores, Dr Harry Elizja, Sandhya Desai, Joseph Nguyen, Caroline O’Donnell and Patricia Tassone. Tai chi demonstrations, line dancing and strength exercises – it was all part of the April Falls Day celebrations at Blacktown and Mount Druitt hospitals today. Information stalls lined Blacktown Hospital’s bustling ‘hospital street’ and Mount Druitt Hospital hosted a trivia event for patients in the rehabilitation unit to promote falls prevention and knowing the signs of frailty. Joyce Timtim and Nevaylah Ivy Horsting with Shanon Bielby. Senior clinical nurse consultant Caroline O’Donnell said the event was a great success. 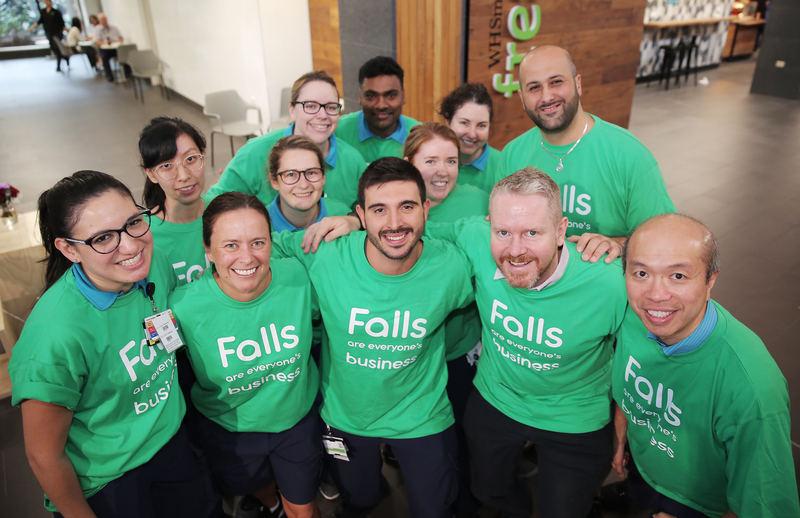 “We had staff wearing shirts with the slogan ‘falls are everyone’s business’ and we offered information stalls featuring equipment, technology and resources,” Caroline said. Blacktown Aquatic Centre vouchers were offered to staff, patients and visitors to promote participation in aquatic exercises and other classes at the centre. “Swimming can strengthen your core and prevent falls,” Caroline said. Hospital pharmacist Stuart Binns, cath lab nurse Ranjeshni Parmanand and consumer representative Monique Pockran. Caroline thanked Blacktown and Mount Druitt hospitals’ Falls Committee for organising a great event. Falls prevention in NSW is led by the Clinical Excellence Commission. The organisation’s Falls Prevention Program Lead, Lorraine Lovitt, said there were a range of signs of frailty and patients with three or more warning signs should talk to their health care team. Blacktown Hospital physiotherapist Andrew Portelli takes part in the tai chi demonstration at Blacktown Hospital. “The signs include unintentional weight loss, weakness, slower walking speed, exhaustion and low activity levels are all signs of frailty,” Lorraine said. Frailty can impact a person’s ability to function as normal and maintain their independence. Falling is strongly linked to frailty so addressing this issue is important for overall health and wellbeing. Blacktown Hospital’s [physiotherapy team performed strengthening demonstrations for staff and patients. Lorraine said that a person does not have to be older to be frail and those with chronic medical and mental health conditions are also at an increased risk of frailty. Blacktown Arpil Falls activiation stall. Blacktown Physiotherapy team performing strengthening excerises demonstrations for staff and patients. “Some signs of frailty can be reversed or treated with appropriate help. People can improve their physical activity levels with emphasis on strength and balance exercise, improve their nutrition intake with an increase in protein and reviewing and optimising medications can also play an important role,” Lorraine said. Patients, staff and visitors took part in the April Falls Day event at Blacktown Hospital. Western Sydney Local Health District oversees a range of programs to help support patients at risk of falls and address issues including frailty. To find out more contact Kitty Kaur on 9849 3708. If you are a WSLHD staff member, more information can be found on the Intranet here.